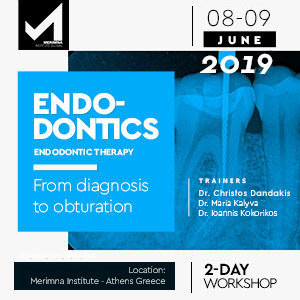 Τhe aim of this course is the presentation and analysis of diagnostic and therapeutic problems related to Endodontics and familiarization of the dentist with the chemo-mechanical preparation and the three-dimensional obturation of the root canal system. Merimna Institute invites for first time three Endo specialists that will offer all their knowledge and participate interactively during the workshops. Every delegate will practice in two diferrent preparation systems and two different root canal obturation systems. Especially trainig will be take place by microscopes and digital X-rays. Clinical Endodontology was recently dominated by plenty of technical developments related to new equipment, modern tools and materials and innovative techniques in order to provide more comfort to the dentist in the treatment process. The crucial role of microbes and by-products of their metabolism in the development of apical periodontitis has been well-documented. Therefore, endodontic treatment should be considered as the clinical treatment of a microbial aetiology disease aiming to eliminate bacteria and prevent from re-infection. The achievement of those objectives requires thorough mechanical preparation, combined with appropriate irrigants, intracanal antiseptics and three-dimensional obturation of root canal system. The aim of this course is the presentation and analysis of diagnostic and therapeutic problems related to Endodontics and familiarization of the dentist with the chemo-mechanical preparation and the three-dimensional obturation of the root canal system. In selected clinical cases, modern treatment protocols will be presented. Modern scientific data about specific fields in Endodontics will be reviewed through the analysis of these cases. The diagnostic approach to pulpal and periapical disease is usually a complex process, that requires combination analysis of symptoms and radiographic findings. In particular, the diagnosis is based on data obtained from medical and dental history, responses to pulp sensibility tests and radiographic interpretation. Clinical examination and modern imaging techniques contribute significantly to the aforementioned goals. As part of this presentation, a brief reference to symptoms and signs of pulpal and periapical diseases and presentation of the modern classification of those diseases will be done. A prerequisite of proper chemo-mechanical preparation and obturation of root canals is the knowledge of the morphology the root canal system of the tooth. With the development of modern research protocols, it is now evitable for the clinical dentist to display and analyze specific morphological characteristics of the root canal system of specific tooth types. Through the presentation of contemporary studies, concerns related to the number of root canals, the relationship between them, and the shape and location of root canal orifices will be analyzed. Root canal preparation is of utmost interest. It is a process truly laborious, but also crucial for the successful completion of root canal treatment without iatrogenic complications. Particular emphasis is placed on the use of rotary endodontic files, so that the clinician can perform adequately even in the most challenging morphologies. Clinical protocols of engine-driven endodontic file systems will be presented in detail, in order to provide the skill required for everyday use of rotary instrumentation. Irrigation of the root canal system is a matter of daily clinical practice in endodontics. A variety of solutions and regimens have been proposed and investigated thoroughly. Yet, there are aspects of irrigation that are still described and taught mainly from empirical data. A modern approach to irrigants and irrigating techniques will be attempted via a scientifically based overview of the irrigation protocols during mechanical instrumentation. Issues regarding the activation of irrigation solutions, the removal of smear layer, and the use of chelating agents and protocols of final irrigation in Endodontics will be discussed. 2) techniques based on warm vertical compaction of gutta-percha. It is necessary to know and use at least one warm technique in order to be used in appropriate cases. It is essential not only to report and analyze these fields of the endontic science from a theoretical perspective, but also from the practical one, through clinical cases and practice course. The participants must have with them extracted teeth from all tooth types in order to be well-trained even in more difficult and challenging cases. He was born in 1965 in Alexandroupolis. Bachelor of Dentistry in 1991. He worked as a dentist in Germany until 1995. Graduate of program of post-graduate studies, School of Dentistry of Aristotle University of Thessaloniki, in the department of Endodontology. Research Associate of the Greek Society Continuing Dental Education. 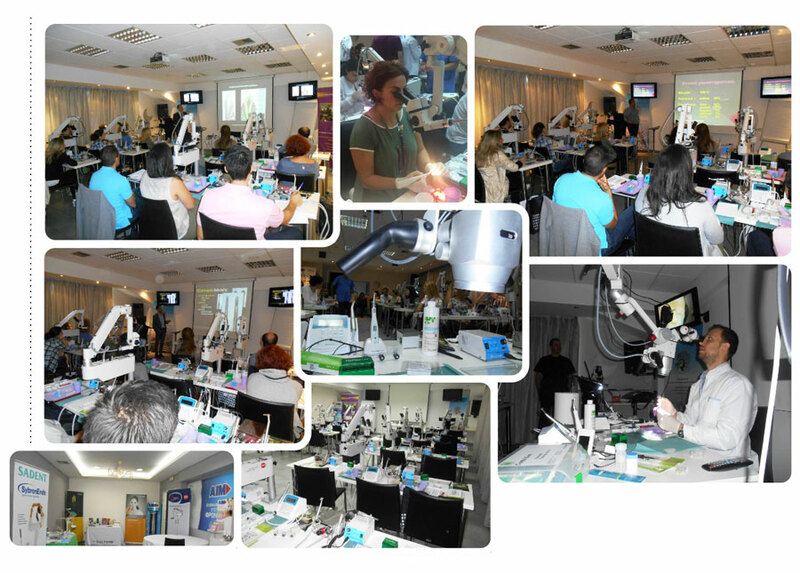 Participate in seminars as a trainer in the field of Endodontics. Maintains a private practice in Thessaloniki and works in Dental Care Thessaloniki with exclusive focus on Endodontology. Presentations and attendance at international conferences and symposia, as well as publications in Greek and international journals on the field of Endodontology. was born in Athens in 1974. She graduated from the University of Athens Dental School in 1998. She subsequently completed her postgraduate education in Endodontics at the Aristotle University of Thessaloniki (AUTH) Dental School in 2001. Following that, she commenced a PhD which was completed in 2010 when she was nominated Doctor of Endodontology based on her Thesis entitled “The role of TGFb1 in the dental pulp repair process. Experimental study”. During her postgraduate studies she participated actively in the clinical training of students in the field of Endodontics at the Dental School of AUTH. She has participated in Greek and International conferences as a speaker and she has published research papers in international scientific journals. She is a member of the Hellenic Society of Endodontics since 2002 and her clinical practice is exclusively focused in Endodontics. Γεννήθηκε στη Χαλκίδα το 1974. Σπούδασε στην Οδοντιατρική Σχολή του Αριστοτέλειου Πανεπιστημίου Θεσσαλονίκης όπου και αποφοίτησε το 1999. Το 2002 ολοκλήρωσε το πρόγραμμα μεταπτυχιακών σπουδών στην κατεύθυνση της Ενδοδοντολογίας, ενώ το 2010 αναγορεύθηκε διδάκτορας της Οδοντιατρικής σχολής ΑΠΘ . Έχει συμμετάσχει, ως ομιλητής σε Ελληνικά και σε Διεθνή Συνέδρια, ενώ έχει δημοσιεύσει ερευνητικές μελέτες σε Διεθνή περιοδικά. Είναι μέλος της Ελληνικής Ενδοδοντικής Εταιρείας και του Συλλόγου Ελλήνων Ενδοδοντολόγων. Επαγγελματικά, ασχολείται αποκλειστικά με το αντικείμενο της Ενδοδοντολογίας σε ιδιωτικό ιατρείο στη Χαλκίδα. 1. Biology of pulp and periapical tissues. 2. Pathology of pulp and periapical tissues. 5. Magnification tools (Dental Operative Microscope). 6. Managing of dental emergencies. 7. Treatment plan. Evaluation of endodontic prognostic factors prior to restoration. 3. Burs/instruments for access cavity preparation. 4. Objectives, guidelines and rules for access cavity preparation. 5. Iatrogenic errors in access cavity preparation. 3. Rules for improvement of access cavity preparation. 4. Location and negotiation of root canal orifices. 3. Shape memory of rotary files. 6. Root canal preparation-clinical protocols. 7. Determination of apical enlargement. 9. Instrument fracture. When and why? 2. Activation of irrigation solutions. 3. Gel or solution. Differences, advantages and drawbacks. 6. Irrigation protocols in engine-driven instrumentation. 1. Modern equipment of engine-driven root canal instrumentation. 2. Familiarization with endodontic motor systems. 4. Irrigation protocols-activation of irrigation solutions. 5. Determination of apical enlargement. 1. Three-dimensional root canal obturation. 3. Efficacy of different combinations of them.